…Or “Top 10 Projects,” for short. Also, before I forget, if you aren’t going to actually read through everything (no judgement) be sure to scroll to the bottom and take the poll. I want to hear what you want to see more of in 2018. I’m not going to number this list, because when I got to figuring which were the most popular, and then factored in popularity on social media, end of year projects that are doing so well they would probably be in the top 10 if they had happened sooner, and various and other sundry things, well, I basically got confused. So here they are. In no particular order. The number one popular post of 2017 is…. [drumroll]…something I built in 2016. Now, normally this would disqualify a post (or the pergola would probably win every year), but here’s the thing: I didn’t really think much of this when I built it as an add on to my kids’ cabin playhouse. Which shows what I dunce I am, because not only do they love it maybe more than the cabin itself, you guys begged me for a tutorial. So I did my best to scrape one up for you this year, and you liked it. You really liked it! 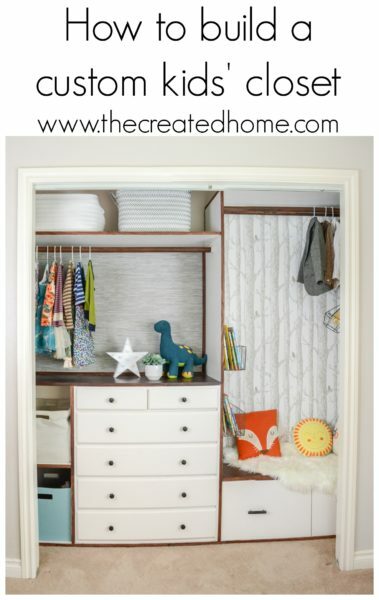 Going with a theme here, this sweet custom closet with a built in reading nook made quite the splash, especially on Facebook, where the video was popular. That’s gratifying to me, first because I really like kid projects, and also because videos are so hard to make, y’all. Seriously. You guys turned up in droves for some Beginner DIY goodness, which makes me all sorts of happy. In fact, I promise you another installment or two of these projects this coming year. I write this stuff with the newish sort of DIYer in mind most of the time, and I’m tickled pink that this collection of fun projects was well-liked. The ultimate DIY dream. If this thing doesn’t make you go gaga you’ve stumbled onto the wrong site. This hutch had me all star-eyed for a long time. I mentioned it to Jen, she went right to work, and BAM, plans. This giant of a build was maybe my favorite build of the year, and I’m so happy you loved it, too. Sooo much detail. So many joints. But also so much satisfaction at making this thing work. 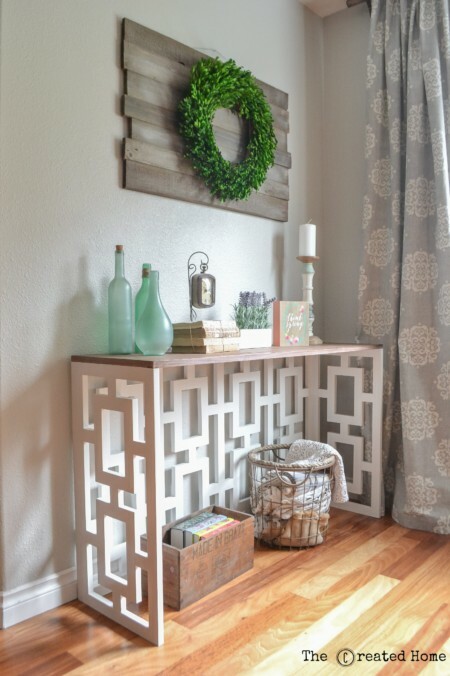 The fretwork on this was unlike anything I had ever done before, but I do love a challenge. Jen was nice enough so slip me these plans before she released them, and I had a blast making it. I adapted it for a 60″ round and made it out of the prettiest reclaimed barn beams from a barn here in my home state. No joke, I fell in love with that wood so much I actually dreamed about it, drove back to the salvage company I bought them from, and had them dig out every last 4×4 beam they had left from that barn so I could purchase them all. I have a problem. A good problem. But back to the table. Sigh. Isn’t it just great? The plans for this beauty and the two projects before it are all on Jen’s site, so be sure to check it out. Because you like her stuff, obvs. In a move somewhat out of right field, this post detailing how my husband and I upgraded the garage shop with Rust-Oleum Rock Solid was one of the most popular posts. Frankly, I wasn’t sure you all would like it, even though I think it’s pretty flippin’ fantastic. Once again, I clearly have no grasp of what people like. And you all love it. I get a ton of questions about this thing, so I tried to answer them all in a follow up post. 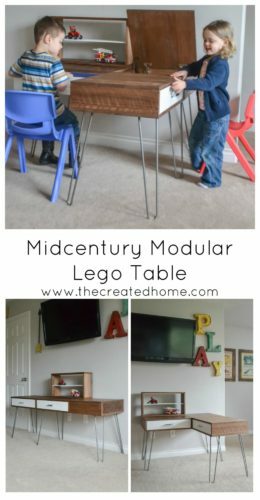 There are at least 4 billion versions of the Lego table out there, so I’m gratified that a few of you liked this one. Finishing up the top 10 is another popular video post. I don’t know if it’s because it was a video or because you all hate rounded corners, too, but either way, I’m happy. This is still one of my favorite home updates, and one I appreciate every day. I’m glad you liked it, too! 2017 was full of ups and downs, and that rocky road has led to new and exciting paths. A couple of months ago I shared that my husband left his career (well, mostly) in clinical administration to start flipping homes full time. It was a big move, and we are really excited about the new direction. I was able to close down my work doing custom client builds in order to keep up with blogging and doing work with the flip houses, which includes a number of custom projects. Tutorials for many of them will make it here to the website, and I hope you will love them, too. Thank you for your support and kind words throughout 2017. I wish you the best for this new year to come, and look forward to seeing what you build! Oh! I almost forgot. Check out my little poll below to let your voice be heard! I am very interested in learning what you all like to follow and what you would like to see more of. Click below and let your voice be heard!